Last weekend we went to PD for a short trip and on our way back, we detoured to Mantin and bought some kampung durians, selonggok RM20 only but with so-so quality. The star of this post is the lil' princess in our family. Click here to view her profile which I have posted earlier on. Got it? Her fave food and fruits still remain as durians! By the way, we did give her two bites of the premium quality ones lar. Precious pea, your pumpkin and pea luv durian or not? SO SO CUTE!!!! I think Pea and Pumpkin will like durian cos they were drooling when they saw me eat. But then i dunno dog can eat durian or not so i dare not give, scare heaty. Ur princess so cute leh! so adorable!!! so cuddly!!! so cute!!!!!!!! Haha... this cute dog drools at everything i eat everytime i visit! 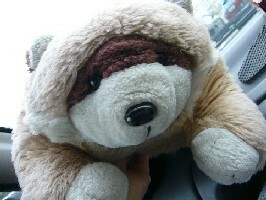 Hei since she shares the same interest as the owner, i hereby declare this doggie the mascot of KLpeopleKLfood! 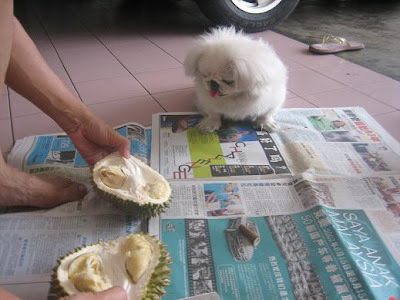 now for the first time this blog kinda educational "dog eats durian too"
Have to say the same word again..but it's the truth: So Cute!!! wah! the princess is revealed..dis 1 also very very da cute ler..sommre eat durian..kuchi kuchi koo..
omigosh, so uber cute leh and clever too! Bcus of u, always feed her wiv sweets, now obese oledi n gluttony like me. 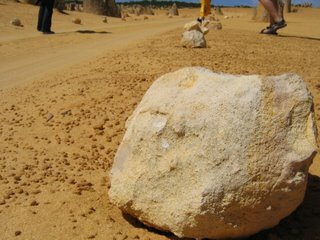 aiya, my blog is always educational one lar. of cus dog eats durian la, my dog even eats cheese cake and drink mango yoghurt. 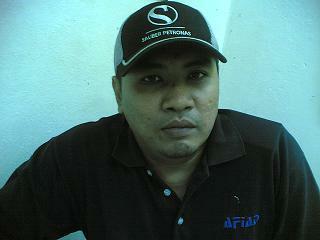 So terror.Must be gud quality one. Tq. Actually i think she is obese. Good relaxing life + extremely well fed. *arhem* wat species are u? Me ah? Chi "kok kok".. haha! Very cute and I love the expression she has staring at the durian. Smart doggie who knows her food so well. Oh yes, she definitely does. Kinda headache when feeding her cus she is sooo picky! 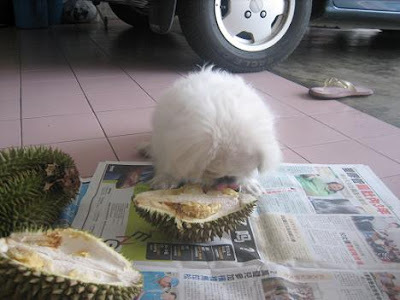 An adorable ball of fur & a durian lover to boot. 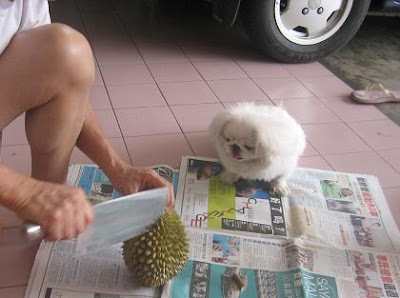 Think most dogs do eat durians but rambutans & mangosteens .. err haven't seen 1 yet. instead of chiwawa, I have "chi kok kok" loh. New breed, you don't know? hahaha! Err...actually my dog luvs rambutan veli much too! But havent tried magosteen cus it might be too sour to her liking. U noe, she is a professional foodie. Nvr eat dog food one. wahhahahahhahaha you have to bring your dog to the durian party! hmm...good idea! If u dun mind she sapu all the goodie ones. Really???how? wat column?The interesting pix column one ah? 100% sure lar. lolz if dun eat dog food then eat wat? half of ur dinner?